…and all that move in the Waters, bless ye the Lord: praise him and magnify him for ever.' The words of the Benedicite (and also those of the Te Deum) are inscribed around the walls of the south transept of St Mary's church, Buckland, forming a key element in a striking decorative scheme. 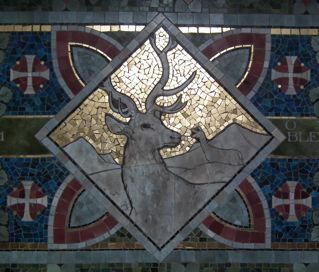 The transept was redecorated in the early 1890s with a stunning mixture of mosaic and opus sectile work (the latter a technique of building up designs or pictures using larger pieces of inlay that the tiny tesserae employed for mosaic). The scheme was paid for by William West of nearby Barcote Manor as a memorial to his wife. The decorations were designed by Henry Holliday, a painter, designer, socialist, women's suffragist, and associate of the Pre-Raphaelites who continued to work in the Pre-Raphaelite vein well after the heyday of the movement. 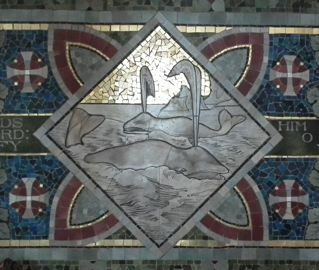 High up on the walls are mosaics of saints beneath ornate canopies, but at least as eye catching are these diamond-shaped panels illustrating those beings and phenomena – the lightning and clouds, the fowls of the air, the beasts and cattle, and, of course, the whales, that are exhorted to praise and magnify the Lord. 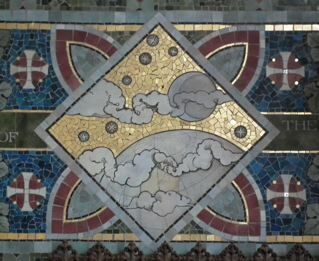 Each small picture combines pale stone laid out in opus sectile with glittering mosaic used for the sky. The earth and its creatures are lovingly and carefully delineated, and the heavens are filled in in dazzling gold. 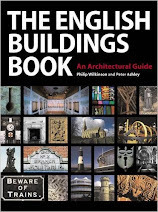 *Buckland is now in Oxfordshire, but I use the traditional English counties because they reflect the usage in Pevsner's invaluable Buildings of England books – and because I like them. I'm continuously humbled and astounded by the beauties to be found in English churches, especially those that are off the tourist trail and off the radar of all but the most assiduous and specialised art historians. Buckland, in the marshy area not far from Faringdon, is a case in point. You could spend a day or more in this building, which has evolved steadily over the centuries and incorporates the work of artists and craftworkers from every period from Norman to Victorian, and still not see everything. For now, I'll limit myself to a couple of details from either end of this vast historical span. The first you see before you even get properly inside the building. 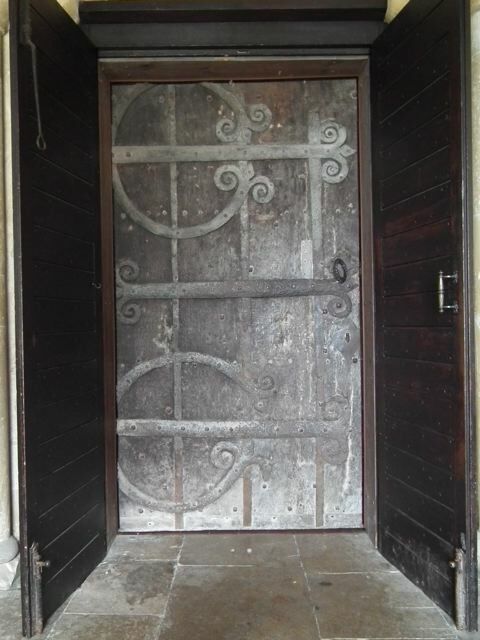 This door dates to the 12th century, making its simple ironwork among the earliest one is likely to find. 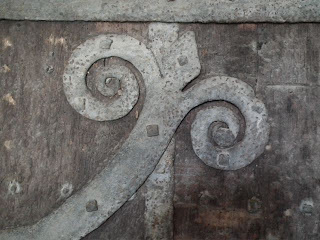 The metal has been cut quite crudely, but the broad horizontals, the great rounded forms, and the more tightly circling scrolls with which they terminate have been made with a certainty of purpose that no doubt made them as easy to admire in the Middle Ages as they are today. This ironwork has been fulfilling that purpose – multiple purposes rather, to provide hinges, to bind together and reinforce the timbers of the door, and to decorate its surface – for some 800 years. Standing near the beginning of a long craft tradition, it deserves to be far better known than it is. Although famous for its stone-built colleges and churches, Oxford in the 19th century became a city of brick. Vast brick-built houses – some Gothic, some "Queen Anne" – fill the grander streets of North Oxford. 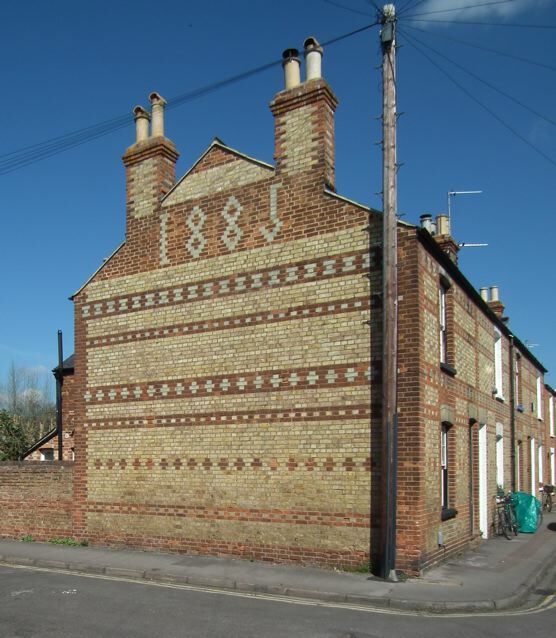 Smaller brick terraces line the streets off the Cowley and Iffley roads in East Oxford. And out beyond the station is a further group of small streets near the river in the area known as Osney. Some of these are built of brick in more than one colour, and here the builder has addressed the issue of what to do with the blank wall at the end of a terrace in a refreshing way. The effect recalls one of those fabric samplers that young women used to use to demonstrate their embroidery skills. 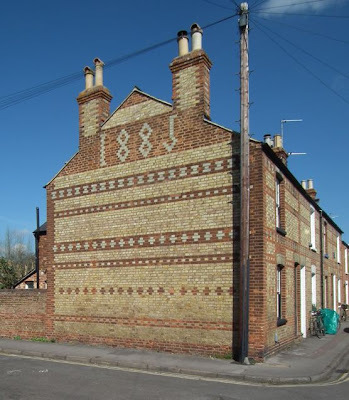 Unlike the multi-coloured samplers, though, the "stitches" are in only two colours, in rows of patterning that continue the strips of red and buff on the fronts of the houses. It's effective, even if the positions of each strip have more architectural relevance on the fronts, where the patterned bands relate to such structural details as the tops and bottoms of windows. The numbers of the date, which start off confidently, run out of steam when it comes to the final 5. But full marks for trying, and for enlivening an unregarded corner with a bold bit of folk art. 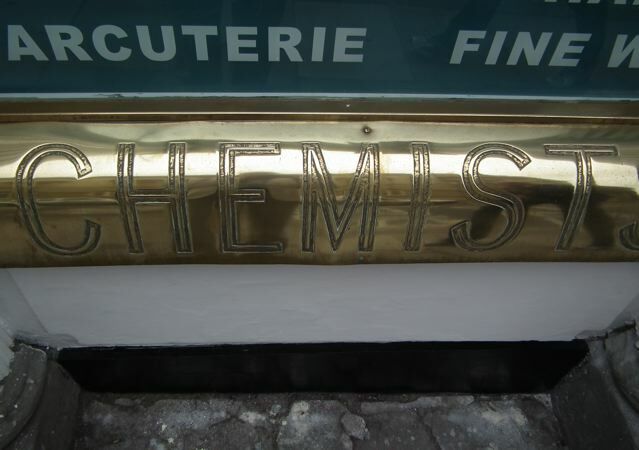 I'm not sure if I'm right, but I associate these large brass shop signs particularly with chemists' premises. They were an elegant fashion of the 19th century, and the curving line of the sign catches the light well. No doubt the resulting glitter reflected that of the various medicine jars that were once displayed in the shop window. The use of brass perhaps also embodies the pharmacist's association with the medical profession. Doctors, after all, traditionally identified their surgeries with a brass name plate (the French talk about a doctor "putting up his plate" when a new practice is established). Whether or not this is the case, brass signs like this are certainly eye-catching, and I was pleased to find this one surviving on a shop long since given over to the purveying of cheese, coffee, charcuterie, and "fine wines". The letters are cousins of the sans-serif or "grotesque" capitals I noticed here, although they take an outline form and are maybe rather thin and spindly. 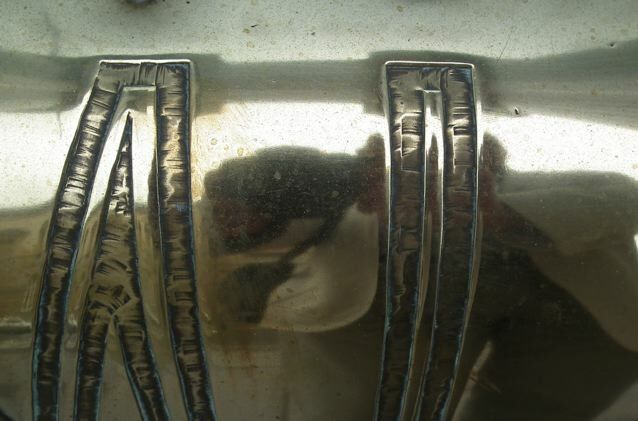 Their details owe more to the metalworker than the sign-painter or stone-carver. But looked at from a distance, the outline form of the letters makes a clear and stylish impact. Examined more closely, they show the irregular impressions made by the metalworker's tools, as if the letters did not get the way they are without a lot of hard work. This is mark-making with a difference, and the result sets up a lovely counterpoint between the straight lines of the letters and the irregular strokes within those straight lines, between roughness and, what we first notice when the sign catches our eye, sheer polish. When it comes to the way I look at buildings, context is everything. 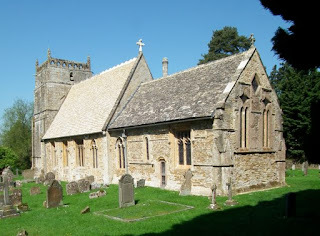 Swinbrook is an Oxfordshire village known as the home of the Mitford sisters and famous among church-crawlers for some striking monuments inside the parish church. But before we get inside the church, the place itself. The "brook" in the name is a key clue. This is a place in a valley that is often flooded and the village is dominated by water. A stream flows through the centre, following the line of one of the roads; a street meets the stream at a ford; one is never far from the sound of trickling water. When I pass within a mile of the village on the A40 near Burford, I always glance down into its valley to see if the fields are flooded. 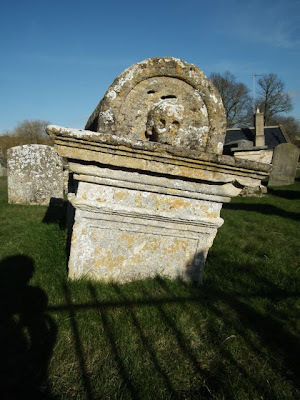 Swinbrook is also a place of stone, the oolitic limestone of the Cotswolds. There are stone farms, stone barns, a stone pub. People here live in stone houses and when they die, they are buried beneath stone monuments. 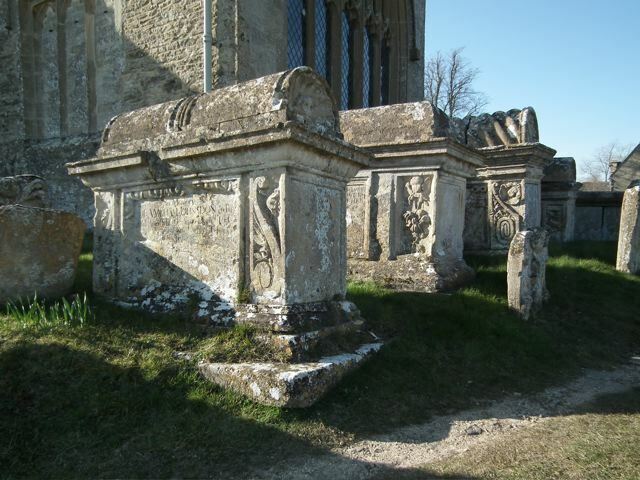 Some of the most vigorous stone-carving from the late-17th and 18th centuries is found on these monuments, the chest tombs in this and other churchyards on and near the Cotswolds. These box-like tombs sit above the grave (the deceased is buried in the ground beneath, not in the stone structure itself) and provide five surfaces for the carver to work on. In this area, the chest is often topped with a half-cylindrical upper section. These curved tops have reminded some of bales of wool, and these structures are often known as bale tombs. The bale tombs in Swinbrook churchyard reveal the work of carvers quite at home with the classical language of mouldings and frames and – as far as one can see, as the inscriptions are very worn now – with classical lettering too. And in and among these classical details are deeply carved cherubs, foliage, scrolls, and skulls. The bales that top the tombs, some incised with a few elegant bands, some carved deeply with spiral ridges, enhance the effect. It's lively work – if that's not a contradiction when talking about tombs, some of which portray symbols of death such as skulls – and one can sense a happy combination of Cotswold stone, artistic talent that can combine classical norms with individualistic details, and local families keen to remember their dead in this striking way. One reason why these tombs are so moving is because they are no longer in perfect condition. The details are getting blurred, the corners softened, the lettering is hard to make out, and some of the tombs are subsiding into the ground. One feels privileged to see them, their carving rendered all the more effective when the early evening sunlight warms the stone and throws the work of the sculptor into deep relief, in the same way that one is relieved to find that Venice has not yet slipped into the lagoon. I don't know anything about this relief. Positioned high on the wall of a cinema in a side street in Oxford, it may be by Newbury Trent, who did many carvings for cinemas. 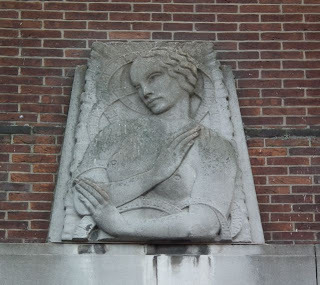 Its subject is a cousin of the curvaceous and silvery women who adorn a former cinema in Cheltenham and who were the subject of one of my previous posts (that Cheltenham building is still empty and yet more unkempt since I posted it back in 2008). It's not the greatest piece of carving. The hands, elegant as they are, don't quite work for me, and, if you will pardon the expression, the breasts don't repay close examination. But I like her face, which seems to me to be sensitively carved, and the way the film snakes its way around the figure, part frame, part secular halo. The simplified tripartite wave of her hair is perhaps a signal that we should take the whole carving as designed to be looked at from some distance without the assistance of the zoom lens I used to take the photograph. The relief is a relic of a time, the 1930s I suppose, when cinema was the epitome of glamour and modernity and when old established arts like sculpture could be brought to its service. Cinemas of the 1930s – along with contemporary factories and other buildings – were often decorated with this kind of carving. 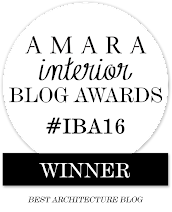 Such decoration forms a reaction to the minimalist modernism of buildings in the tradition of Le Corbusier – and ultimately of the Central European architect Adolf Loos† who declared that ornament is crime – and shows how buildings can be modern and ornamented at the same time. 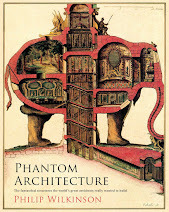 And if buildings connected with the arts cannot be a bit showy, what can? † Loos was born in Brno, another of those with Czech origins (think Freud, Mahler, Rilke) subsumed into the all-embracing Austro-Hungarian culture. Writing about the Dying Gladiator in Brigg in a recent post has alerted me to three dimensional inn signs, a phenomenon I've noticed in this blog before. The White Lion at Upton is another inn with a three-dimensional sign, still more striking – although less remarkable in subject matter – than the Dying Gladiator. The White Lion's building goes back to 1510 and the inn now has a classical frontage on Upton's main street. It was the hostelry of choice for Prince Rupert and his followers towards the end of the English Civil War and, while the Royalists were enjoying the inn's hospitality (or sleeping it off) a small group of Parliamentarians occupied the local church, held out until they were reinforced, and sent the Royalists packing to Worcester, where they were defeated by Cromwell a week later, bringing the war to an end. Among later guests at the White Lion was the novelist Henry Fielding, who has the eponymous hero of his novel Tom Jones put up at the inn. I don't know if the lion above the doorway had been installed by this point. 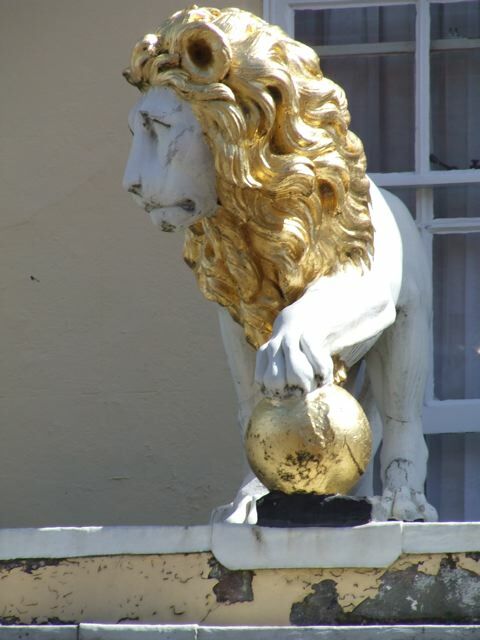 Probably not, as it looks of a piece with the late Georgian or Regency-looking facade, so perhaps the creature has been there, looking down from the top of the inn's Doric porch, his gilded mane catching the sunlight, for just over 200 years. There is more about the White Lion here. For more 3D inn signs, see my posts on the Swan Hotel in Wells and the White Hart at Hingham. Corrugated iron churches are usually quite small. Often serving small isolated communities or providing temporary accommodation before a more permanent building was erected, they are usually simple and modest – straight walls, rectangular windows, no tower or spire. In the 19th century, you could buy them in kit form from several manufacturers, who would quote a price based on the size of the congregation and deliver all the parts to your local railway station. Refinements, such as pointed Gothic windows and bell turrets, were available at extra cost. 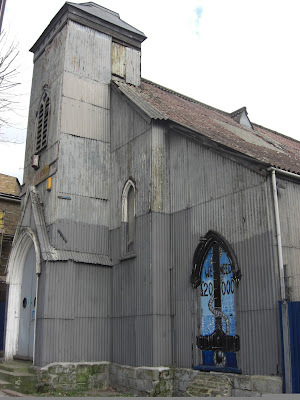 The large corrugated iron church in Kilburn, northwest London, is different. It's elaborate and unusually large for a "tin church". It has a big footprint, gothic windows and doorway, and a substantial tower. Inside, iron columns hold up the roof. That tower even has what looks like the base of a splay-footed spire. This is not your off-the-shelf mission hall or tin chapel, but, I'd guess, a building specially created for the location. Boulton and Paul of Norwich, one of the largest manufacturers of corrugated iron buildings, advertised "Special Designs prepared to suit any situation or requirements". This was no doubt the sort of thing they had in mind. So what were the situation and requirements? When this church was built in 1863, J L Pearson's magnificent St Augustine's, Kilburn, was being planned nearby, a town church on a grand scale that would be one of the landmarks of the Gothic revival. Like so many corrugated iron churches, the one in Cambridge Avenue was a temporary building, put up, according to my online reading, as a stop-gap building until St Augustine's was ready. Remarkably, the building has lasted not ten years but 150. Its survival into the 21st century is due at least in part to the Sea Cadets, as it has been a Sea Cadet base – a training ship, indeed – for several decades. Because the church is currently in need of repair, the cadets are occupying another building now while money is raised to do the necessary work. One hopes they succeed, so that this hardworking, practical bit of corrugated iron Gothic can have a new lease of life. With thanks to Joe Treasure for telling me about this church and providing the photograph.